I spent a huge part of this week at the sewing machine, anxiously piecing curves. Last week I was in the zone, singing away, admiring the fabric, but this week was about matching seams and praying to the gods of pattern design. Every time I design a new quilt a little voice in my head says, it may not look the way you think it will. I’ll test and re-calculate, but the voice doesn’t shut up until the top is done. And this one came out pretty darn great, if I can say so myself. The design had come to me when I was at the Jersey Shore with family this summer, enjoying the freedom and inspiration of a break from routine. I was afraid I would forget it by the time we came back, so after dinner and before Cards Against Humanity, as the cousins played Wii, I furiously scribbled it out with crayons. 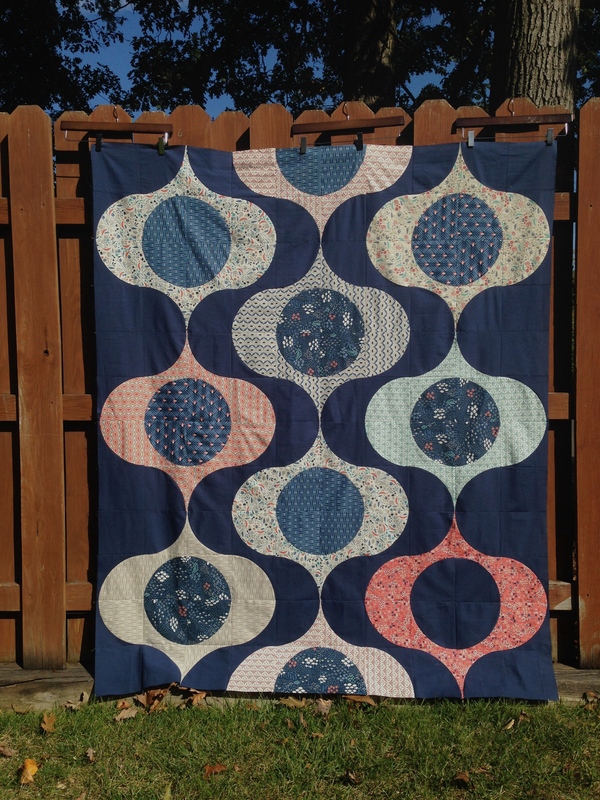 The fabric is Wildwood by Elizabeth Olwen for Cloud 9, and the navy is Cirrus Solids in Ocean. I’m furiously quilting to finish it up next week and will be sure to take all the glamor shots. Oh I cannot wait to see this one in person. It’s spectacular! Absolutely gorgeous! It reminds me of Christmas ornaments my grandmother used to have. I hope you do a pattern! Beautiful Christmas tree baubles, made from Venetian glass. It’s a wonderful top, and I’m interested to see what you’ve chose for the quilting. :O this is stunning! I know I keep saying stuff like this on IG, but REALLY! Wow. Is this going to Market? Are you writing a pattern? Excited for you!